A dish that resembles sea-monster hair. 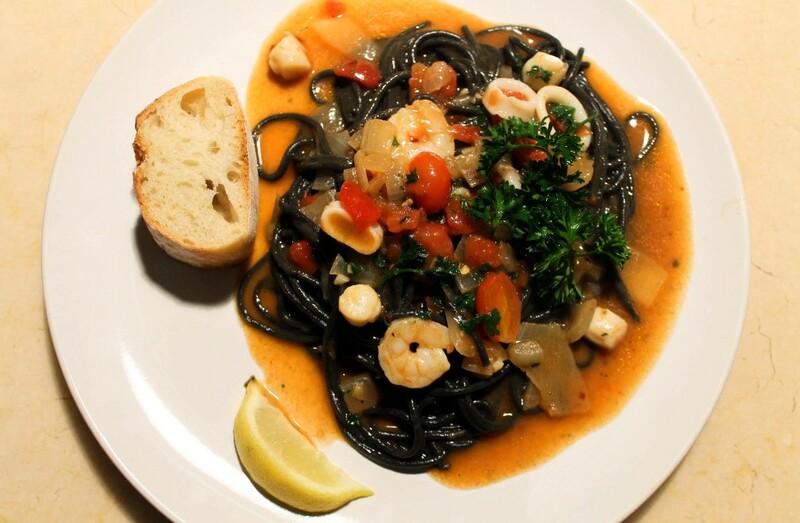 One of the greatest purchases I made over Spring Break was a package of squid ink spaghetti from the Bi-Rite Market in San Francisco. The label said “Spaghetti di Nero,” which my mind translated to “Spaghetti of Nero”; I naturally associated this with the tyrannical emperor Nero of ancient Rome, who played the fiddle while his empire burned to the ground (or so legend claims). 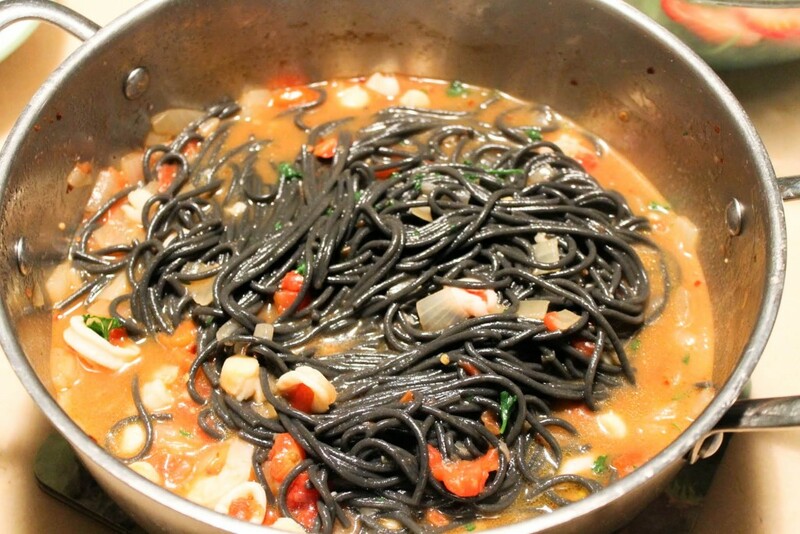 I have now accepted the fact that “spaghetti di nero” is simply “black spaghetti” in Italian. How disappointing. As I scoured the Internet for ways to cook my black spaghetti, I found a 5-star review for a recipe on BBC’s “Good Food” website entitled “20-minute seafood pasta.” I’m pleased to report that ‘twas a wise choice in trusting the broadcasting corporation responsible for one of the greatest detective shows of all time (in my humble opinion, of course). This recipe is a 5-star for two great reasons. 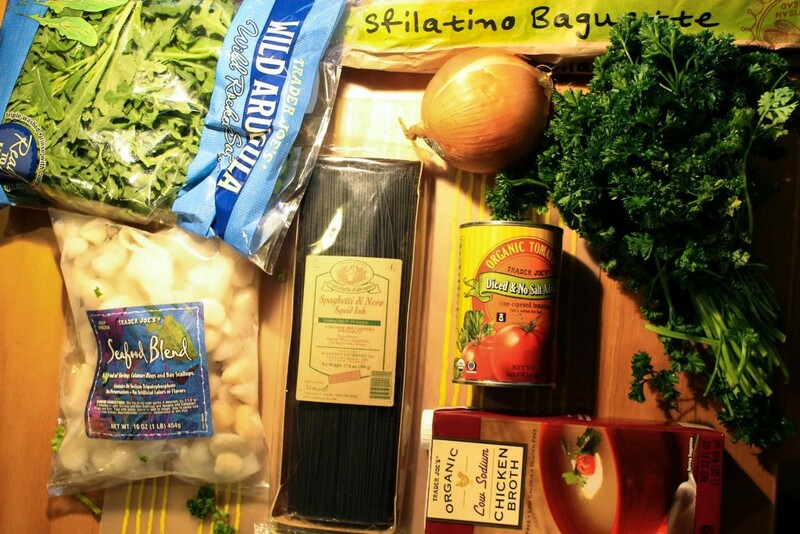 Firstly, you do not need to cook the pasta in a separate pot because the pasta goes directly into the sauce. Don’t panic when you see a huge pot of chicken-stock soup because your pasta will absorb and reduce most of the liquid. That means that you will have enough sauce to happily sop up with some crusty bread, and you’ll have one less pot to wash! Secondly, the recipe is extremely versatile. You may substitute coriander for parsley, basil for coriander or add red pepper flakes, grated Parmesan, more garlic, extra splashes of olive oil, halved cherry tomatoes…the possibilities are endless; and the recipe will taste wonderful no matter what you do. 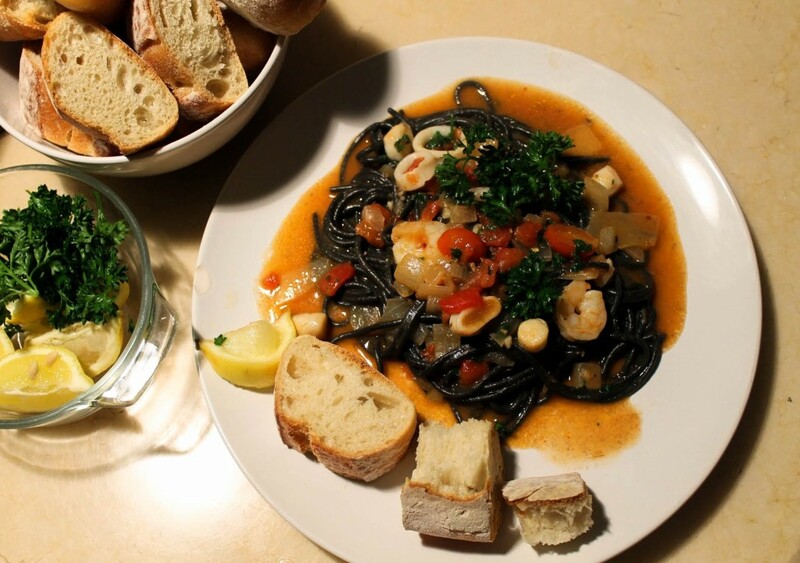 Accompanied by a refreshing strawberry-arugula salad and a rustic artisan baguette, the seafood spaghetti di nero was a splendid success for me, making for a delicious Italian dinner experience without the expensive bill. I highly recommend finishing the meal with a cup of tea and Trader Giotto’s chocolate-dipped almond biscotti for pure joy and contentment. 2. Cook the onion and garlic over a medium heat for 5 minutes until soft, stirring occasionally to prevent burning. 3. Add the paprika, tomatoes and stock. Then, bring to a boil. 4. Turn the heat down to a simmer. Stir in the spaghetti and cook for 7 minutes, stirring occasionally to stop the pasta from sticking together. 5. Stir in the seafood blend. Cook for 3 minutes more until it’s all heated through, and the pasta is cooked. 5.5. Season to taste. Sprinkle with parsley and serve with lemon wedges.